The resin is the usual type from Verlinden in that it is cream and fairly solid though not unworkable. The only bubbles I found were on the “non-show side” bottoms of the turret and base. I did stress test these a little by bending them a bit around the edges of the base – it did not break or crumble which is very assuring. Mine came wrapped in bubblewrap and there weren't any broken parts inside which are a common theme with larger diorama pieces. Germany used several turrets from both their own and captured tanks as stationary pillboxes during WWII. 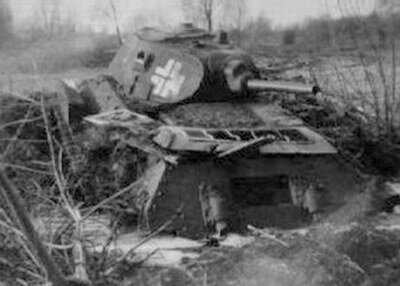 Here are two shots of T-34’s dug in and with their turrets only on pillboxes in various situations – so these did exist. I think this is an interesting idea from Verlinden. The main part of this kit is the T-38/85 turret and the concrete pillbox it sits on. The pillbox itself is a cream resin construction of one part that sits flat on the base you have for it or just by itself. I like it that this sits very flat to the deck – it could sit onto a flat base and blend in quite easily to any scenery you are planning for it or indeed as the whole base itself as the soldiers are positioned on top of it. There are some nice wear and destruction holes from enemy action as well which are ripe for some weathering. Shell holes not only in the concrete but in the turret which looks beaten to hell – very nice. The turret displays all of the characteristics of a late war "Flattened Style" Turret, 1944/45 Production. What isn’t reproduced thoroughly however is the large resin block on the bottom of the turret – a relic of the casting process. This needs to go! I removed mine with my Xuron knife /Swan Morton scalpel blade in 20 minutes - this is the hardest work in the whole kit and if this is as bad as it get we don’t have it too bad after all. None of the turret details were damaged in my heavy handed removal – even the lift hooks on the side stayed there – this was my greatest worry alleviated. The barrel for the gun has a hollowed end and the turret has a hole that needed a little clearing before the barrel slipped in very nicely - it holds without glue which is good if you want t take your dio to a show. After this work it all sits nice and flatly in the cast pillbox and looks pretty good. 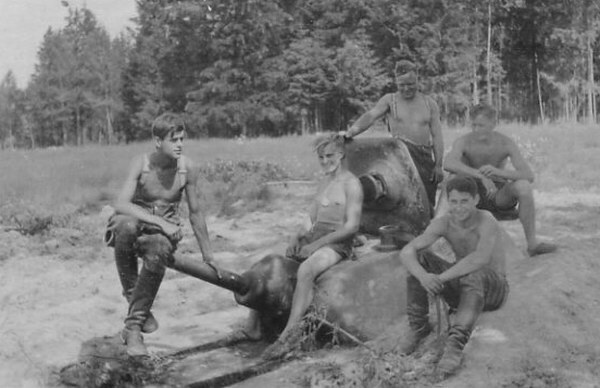 Ammo is also included for the main gun – spent and unspent – to be scattered around the dio. 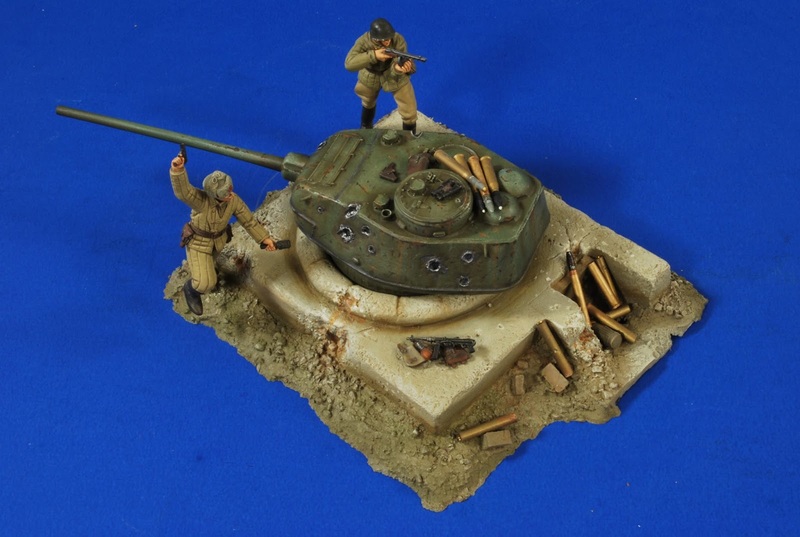 The kit comes with not just the pillbox and turret but also with two full figures of soviet winter weight soldiers storming the position. 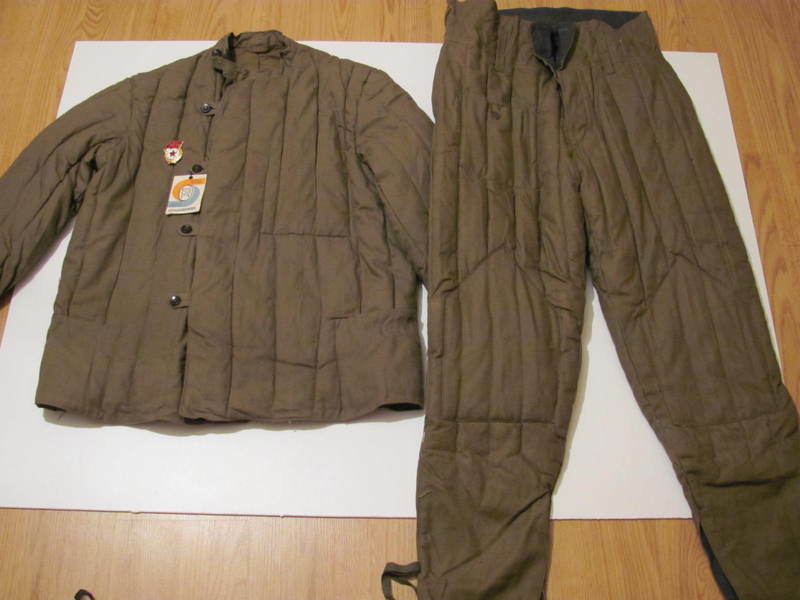 The figures are wrapped up for winter war – their padded "Telogreika" jacket and padded trousers are a common part of the red Army uniform of that time – as was the fur lined “Ushanka” Russian hat. The soldiers have all of their weapons and personal packs and equipment included as well. The heads Verlinden make are often said to be a little “long in the face.” I can see where people are coming from but I think this is unfair. Everyone has their own distinctive sculpting style and François is no different. It is a case of if the face fits and in this case the two heads in this kit are pretty well detailed and nicely executed. Both are yelling in anger/fear/terror and look pretty convincing. Both are in their padded ushanka fur hats, and both fit into the necks of the torso’s pretty well. 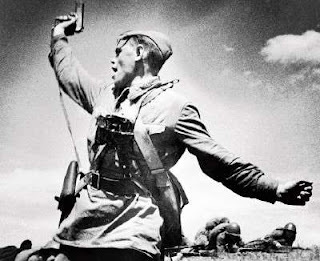 The first soldier looks like the superior – he is holding his arm aloft in an almost worthy of a propaganda poster image with his pistol in that hand and a spikey RGD-33 grenade in the other hand. The other soldier has his padded jacket on with regular thick breeches and high boots. He carries a PPsh-41 whose ammo clip is separate from the gun. It does take a second to carve this out a little before it fits where it should but it is a minor cut. No danger here. Both of these soldiers have included in the pack forage bags, grenade satchels and other resin bits to flesh them out and create depth on the figures. 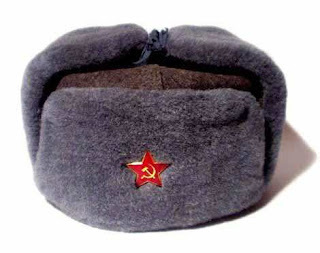 The Red Army soldiers weapons and equipment as well as are items of German personal equipment and weapons - Two MP40 sub machine guns, binoculars, map pack, a gas mask, canteen, bread bag and flask and a pistol in its case. These are provided and probably you only would want to use a few items – it’s very nice to have the choice though. Well that is all that comes in the box – a pretty neat diorama and something of interest for those who like both soviet vehicles and these interesting pillboxes. The figures do not disappoint and with a little work will really sit this dio a lot. Another nice set-piece battle dio from Verlinden – more like this please.